Last week I was dropping Natalie off at school and I noticed a bunch of kids—older kids, so they had to be fifth graders—holding projects. Hmmm. Tommy, who is a fifth grader, had never mentioned any project. There hadn’t been any paper about one in his backpack either. “Why didn’t you TELL me!” I shrieked. I didn’t want to freak out too much because, well, he was sick. But honestly. “So you were going to go to school and turn in NOTHING?” I asked. How could he DO that? I could never have done that. I was not a straight A student but I always turned everything in on time. That might be a problem. Tommy needs an actual paper on what he needs to do. Otherwise he can get lost. He has his teacher and another teacher that they go to for math and science. His real teacher understands how he works. This other teacher might not. “Well, what exactly do you need to do?” I questioned. “Make a molecule,” Tommy said. I waited for my brain to compute. It did not. Molecule… molecule…what was that again? Crap, I need to go back to school. “Okay,” I said. “Okay. Well. We’ll just….Google it. And…come up with something.” I handed him some medicine to take and rushed downstairs. Google told me what a molecule was. 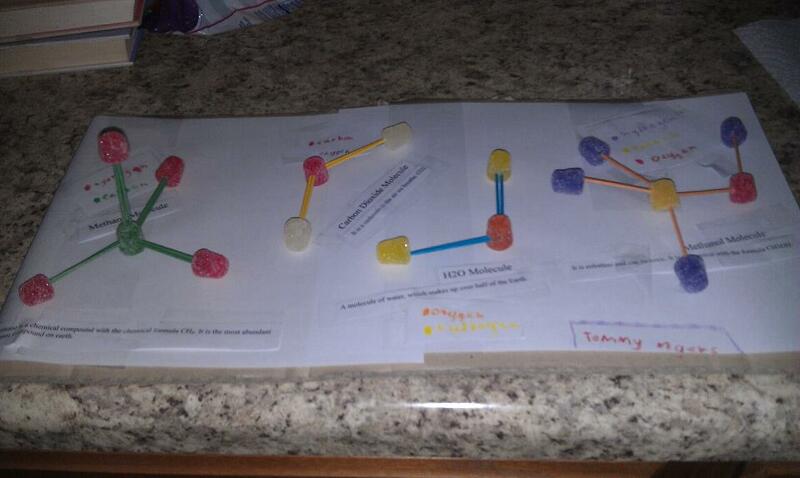 And that there was a molecule kit. Yes! A kit! I am so not crafty. I couldn’t just make a molecule out of pretzels or yard sticks. Plus, the projects I had seen that morning looked fancy. Balls painted bright colors, some even with glitter. I went to Hobby Lobby looking for the kit. No kit. All sold out. 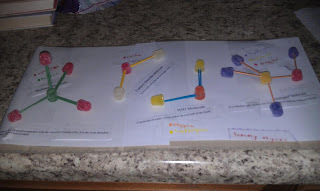 Nothing horribly fancy, but you know, FYI, if your kid forgets to do a molecule project, you CAN make them out of gumdrops. I think he did an awesome job on his molecule! It makes me nuts too when my kids forget to mention things to me until the last minute. Argh! This is soooo going to be Bud in a few years. Not cool. LOL I would have panicked as well! Good thing you found out, turned out great! Hope he feels better soon! Halfway through your post my brain was already thinking about mini marshmallows and toothpicks! Good looking project though, would never say it was done last minute! get it mom! that's awesome you scrambled that together! This may be a little personal, and don't feel obligated to answer, but does Tommy have an IEP? If he does, his teacher is obligated by law to follow all the modifications and/or accommodations he needs. And after it's graded he can eat it. You ARE the good project mom. You helped him get supplies, and you had him do the actual work. He learned from the project. Kids whose parents did the work? I feel sorry for them. Looks like he did a great job with the gumdrops! I would have a hard time not eating them all.. haha! Yay for Google! I don't think I'd survive elementary school for the second time without it. My son used to do that to me ALL the freakin' time. It started around 5th grade and he kept it up until about the middle of his sophomore year - until it finally CLICKED in his head that a project means that you have to plan ahead. I wrote a whole comment here and it somehow got erased. but just wanted to say that I loved your son's gumdrop molecule project. When I taught 8th grade science to an inclusion classroom, I always made sure the kids had a handout to tell exactly what was expected of them for a project, so I can understand your son's need for one in order to work on a project for school. *high five* I call this a mom win! O lord, I am not looking forward to homework. Way to save the day!! !